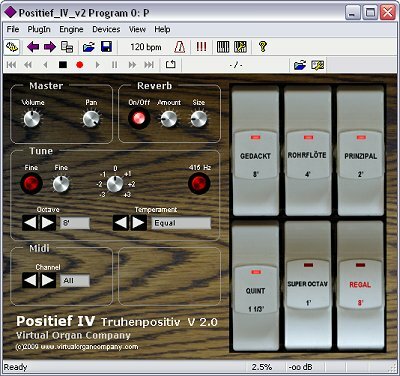 The Positief IV or "Truhenpositiv" is the latest addition to our steadily growing selection of VST pipe organs. Especially designed for the early music enthusiast, It is based on a typical 17th century German "chest" organ, which is a very small organ built into a chest with usually the keyboard on top. As with the Positief III, there is a choice of temperaments and the organ can be transposed and fine tuned. There is a facility to tune the organ immediately to a=415 Hz. You can purchase the full version for only £30 by clicking the button below. Please visit our shop for collections of organ plugins and save money!